Chris Sadowski on his near perfect front lawn at his Oakleigh South home. Photo: Joe Armao. It’s nice to keep your front lawn nice and tidy. But one Oakleigh South resident has taken the idea to whole new level. Since planting his first grass seeds in 2009, Chris Sadowski’s immaculate front yard has caused “hundreds” of passers-by to stop in their tracks and scratch heads in disbelief. “I’ve had people pulling up, getting out of their car, taking photos, feeling it,” says Sadowski, 55. The former electroplating manager began his quirky hobby when he moved back into his childhood home to care for his late mother, who had developed Alzheimer’s disease. The location – directly opposite the Metropolitan Golf Club – brought back memories of slipping through the barbed wire fence as a boy to admire the immaculately maintained turf. “I used to be always fascinated by the green – I think it’s number four,” he recalls. With extra time on his hands, he thought he’d finally have a go at growing a “nice-looking” lawn of his own. The self-taught amateur greenkeeper experimented with several different strains of creeping bentgrass (a popular golf course variety), spraying the seeds with a jury-rigged pump and garden hose onto bed sheets first, to see if they would take. After losing one lawn to a heatwave a few years ago, Sadowski finally settled on his current crop, a neatly trimmed thatch called Penn G2. Complete with arrow-straight lines made by careful mowing passes, Sadowski’s lawn is billiard table-flat and arguably the best in the land. But maintaining such high standards is hard, relentless work. “I fertilise it every five weeks, put fungicide on it (depending on the weather) once a month, and I mow it every two days.” Not to mention the watering. For that, Sadowski installed two 10,000-litre rainwater tanks, soaking his turf up to six times a day in extreme hot weather. 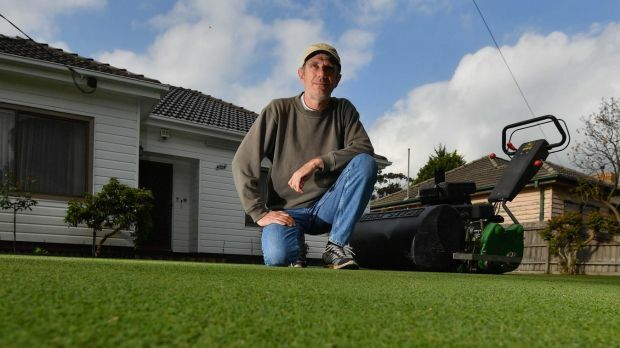 Pre-grown turf costs about $12 per square metre but Chris Sadowski’s 180 square-metre front yard is really a priceless work of art. This story originally appeared in The Saturday Age on 12 November, 2016.